Painting the speed breakers in Banjarahills Road No.10 & 11. As part of “Knot Solutions Pvt Ltd” celebrating its 10th anniversary. Knot Solutions is an IT Services organisation with its Global Head Quarters in Hyderabad, celebrating their 10th anniversary this month. A decade of experience has transformed Knot Solutions into a global player. They would commemorate the occasion with a few community service activities. Mr. Sumanth Kumar Konuru, CEO. 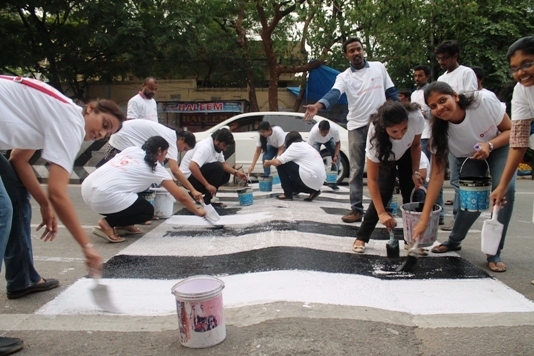 As part of the community service activity they have taken Road Safety initiative to 'paint the speed breakers’ inBanjara Hills Area on 26th June 2016 at 5.30 pm. KNOT SOLUTIONS has a progressive existence in the IT services industry with prime focus on telecom, logistics and energy & utility domains. With the key mantra of "DRIVING GROWTH THROUGH EXCELLENCE", we have successfully enabled a number of customers/operators leverage the benefits of offered products and solutions with our proven expertise in system integration, application engineering, solution development, support, testing and managed operations.